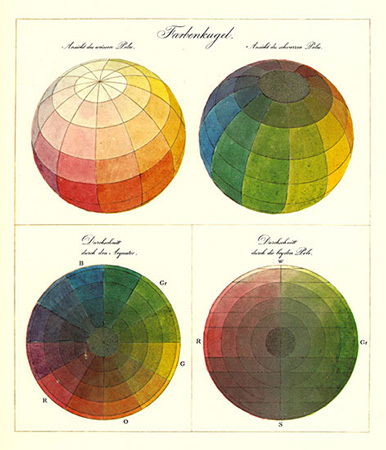 In 1810, the year in which Goethe‘s «Theory of Colours» with its colour-circle (original drawing of Goethe) was published, the painter Philipp Otto Runge presented his work on a «colour-sphere». 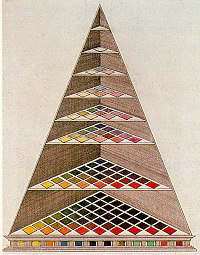 As suggested by its title, Runge was concerned with the «construction of the proportion of all mixtures of the colours with each other, and their complete affinity» (original drawing of Runge). Runge’s sphere appeared in the year of his death — the painter died at the age of only thirty three. 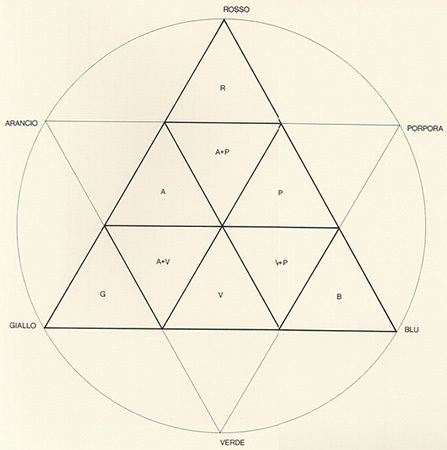 His colour system, once described in an encyclopedia as «a blend of scientific-mathematical knowledge, mystical-magical combinations and symbolic interpretations», represented the sum total of his endeavours. Runge’s colour globe is seen as marking the temporary end to a development which had led from linear colours via the two-dimensional colour-circles to a spacial arrangement of colours in the form of a pyramid. In the three basic colours of blue, red and yellow (which to Runge, as a painter, were subtractive), Runge saw the «simple symbol of the Holy Trinity». He had written this in a letter in 1803. To him, black and white were not mere colours since «light is goodness, and darkness is evil». 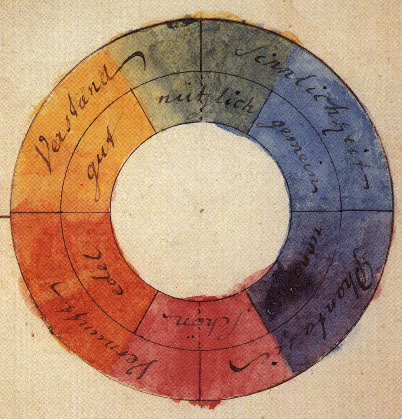 The way to the sphere begins with the colour circle which he drew in a letter to Goethe in 1806 (extracts of which were quoted in the didactic part of Goethe’s colour system): «It is apparent that only three colours exist, and these are yellow, red and blue. If we accept these in all their potency, and if we imagine them arranged within a circle, then three transitional areas of orange, violet and green will be formed (I shall describe everything which falls between yellow and red as orange, or which inclines towards red from yellow or the reverse) and in their middle position these are at their most brilliant and are the pure mixtures of colours.» The three pure colours as well as the mixed colours terminate in the grey of the centre. Grey, of course, can also be mixed from black and white. In 1807, Runge transferred his attention to his model of a «globe» so that the relationship of the colours to white and black could be made comprehensible in the geometrical sense. The colour-sphere originated from this in 1809, the poles of which are black and white. The pure colours run along the equator with equal spacing. 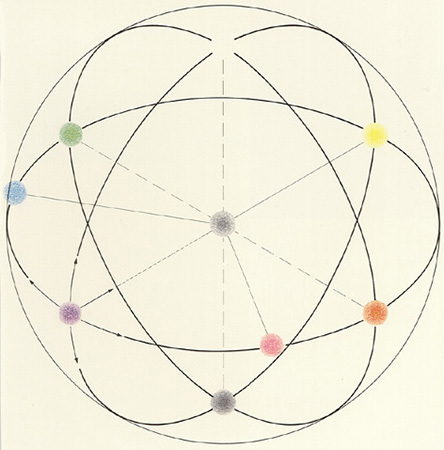 Each colour placed on the surface of the sphere can move in five directions: towards the colours to the right or to the left; up towards white; down towards black; and inwards to the pass the grey of the centre and continue in the direction of its complementary colour. In the introduction to his colour system, Runge complains that artists have been abandoned by scientists because scientists ignored those effects of colour «not explained merely by the refraction of the ray of light». His objective was «to enquire into the mutual relationships of the given colours …. in order that our impressions of their compositions and the altered appearances arising out of their mixtures can be deduced in a definite way, and can each time be reliably repeated when using our materials.» He viewed colours as «a fixed, indeed independent phenomenon» and for this reason his investigations can be regarded «as fully remote from science, in the same way as colours themselves originate out of light». Runge selected the perfect symmetry of the sphere (and not the restricted symmetry of a double cone) because he believed that only by this means could «a completely neutral grey» occur at its centre. Only in this way could the diametrically opposed colours on the surface of the sphere resolve themselves at its central point (illustration). 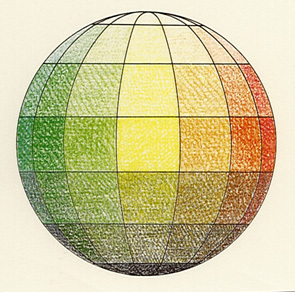 Runge did not want his colour-sphere to be understood as «a product of art» but presented it as a «mathematical figure of various philosophical reflections». 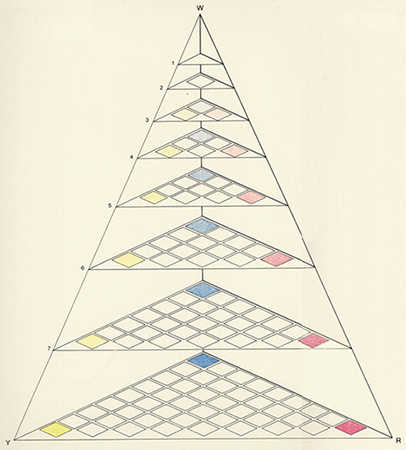 Naturally, Runge knew of Lambert‘s pyramid (historical illustration), but he wanted to place the pure colours at the same distance from white and black and thus decided on a round construction which was also easier to associate with the divine order of the cosmos. Nevertheless, it was clear to him that his proposals could only be an imperfect representation of the ideal sphere, and he must also have been aware that the subtractive colour mixture (this being the only possibility with regard to his paints) did not produce the neutral, middle grey that was so vital to him. Runge may have had something different to Lambert in mind. 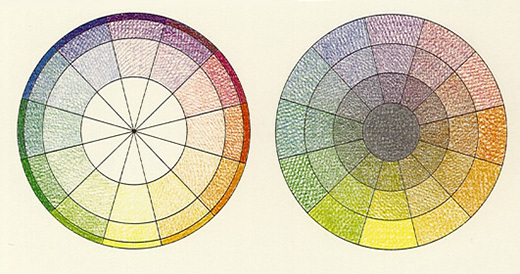 Lambert had mainly wished to present a practical system as an aid to the mixing of colours, whereas Runge did not want to vividly record the proportions of mixtures, but rather the harmonies of colours. He wanted to bring a sense of order to the totality of all possible colours — an order which is defined by a means other than language, as he stated in a letter to Goethe: «If we try to think of a blueish orange, a reddish green or a yellowish violet, it is like trying to imagine a southwesterly north wind». His sphere aimed at the creation of a genuine colour-system, an attempt not surpassed during his century. Date: The painter Runge introduced his spherical construction in 1810 after eight years work with colours. Bibliography: Ph. O. Runge, «Farbenkugel», Hamburg 1810; J. Pawlik, «Theorie der Farbe», Cologne, 1976; H. Matile, «Die Farbenlehre Phillip Otto Runges», 2nd edition, Munich 1979; John Gage, «Colour and Culture, Practice and Meaning from Antiquity to Abstraction», Thames and Hudson, 1993, p. 221 (various illustrations; mention and comment). Catalogue, Runge Centre, Wolgast, Germany.